Two positions dominate and polarize the American body politic today. Some say the war is lost, so leave Iraq. Others say the war can be won, so keep the troops in place. I split the difference and offer a third route. The occupation is lost but the war can be won. Keep U.S. troops in Iraq but remove them from the cities. I already predicted failure for an American-led military occupation of Iraq in February 1991, right after the Kuwait war ended, writing then that an occupation lasting for more than some months "would probably lead to one of the great disasters in American foreign policy." I reached this conclusion on the basis of the Iraqi populace coming "very strongly to resent a predominantly American occupying force." Therefore, I concluded, as the ignominy of sniper fire buries the prestige of high-tech military superiority, "the famous victory achieved by Tomahawks, Tornadoes, and Patriots would quickly become a dim memory." In April 1991, I added that "American troops would find themselves quickly hated, with Shi'is taking up suicide bombing, Kurds resuming their rebellion, and the Syrian and Iranian governments plotting new ways to sabotage American rule. Staying in place would become too painful, leaving too humiliating." With the occupation a half-year old in October 2003, I forecast that "the mission in Iraq will end in failure" because the Iraqi motivation to remove coalition forces greatly exceeds coalition motivation to remain. "The US-led effort to fix Iraq is not important enough for Americans, Britons, or other non-Muslim partners to stick it out." Now again, I reiterate that lack of will (how many Americans or Britons care deeply about Iraq's future course?) means that coalition forces cannot achieve the grandiose goal of rehabilitating Iraq. In calling for withdrawal, critics reflect the national mood that leaves the Bush administration increasingly isolated, a trend that almost surely will continue. But President George W. Bush is right to insist on keeping troops in Iraq. In part, America's credibility is on the line. The country cannot afford what Victor Davis Hanson notes would be its first-ever battlefield flight. The cut-and-run crowd deludes itself on this point. Senator George Voinovich (Republican of Ohio) holds that "If everyone knows we're leaving [Iraq], it will put the fear of God in them," to which Jeff Jacoby sardonically replies in the Boston Globe: sure, "Nothing scares al-Qaeda like seeing Americans in retreat." Contain or rollback the Iranian and Syrian governments. Assure the free flow of oil and gas. Fight Al-Qaeda and other international terrorist organizations. Provide a benign presence in Iraq. 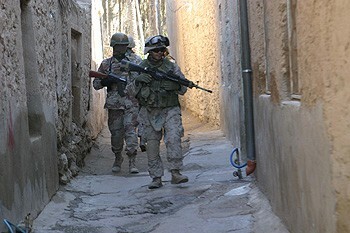 At present, however, coalition forces barely have time to tend to these strategic goals, so bogged down are they with the tactical objectives they do least well – clearing alleyways, keeping the electricity flowing, protecting themselves from suicide bombers, defending the "Green Zone," and many other small-bore tasks. I call for international troops to be released from improvised explosive devices, urban foxholes, and armed convoys, and redeployed to the deserts and borders where they and their high-tech equipment can play a strategic role. This implies the coalition abandoning its overly ambitious goal of a democratic, free, and prosperous Iraq, aiming instead for an Iraq that is secure, stable, and decent. In particular, holding elections in January 2005, a mere 22 months after the tyrant's overthrow, was premature and unrealistic; Iraqis will need years, perhaps decades, to learn the subtle habits of an open society. Removing Saddam Hussein was a realistic and welcome act of international sanitation but repairing Iraq in the face of a liberated, fractured, and ideological Iraqi populace remains beyond the coalition's will. The coalition gave Iraqis a fresh start; it cannot take responsibility for them nor rebuild their country. Focusing on the strategic level also means the coalition distancing itself from Iraq's internal developments and treating Iraqis as adults shaping their own destiny, not as wards: no more hugging the country's leaders, treating its parliamentarians as subalterns, nor encouraging local partners to emigrate to Denmark or the United States. That means staying the course but changing the course, redeploying to desert bases, not leaving Iraq. Related Topics: Iraq, US policy | Daniel Pipes receive the latest by email: subscribe to the free mef mailing list This text may be reposted or forwarded so long as it is presented as an integral whole with complete and accurate information provided about its author, date, place of publication, and original URL.